"An affordable, stainless steel model that can cook seven eggs at once." 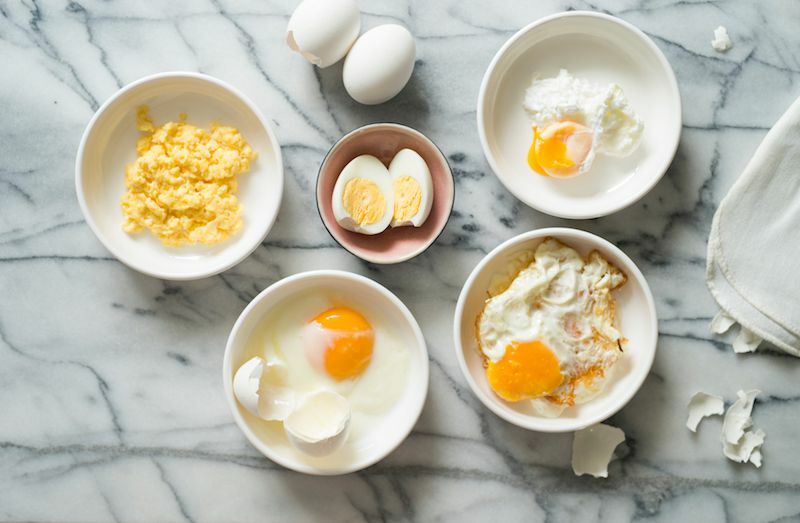 “Make up to six hard, medium, or soft-boiled eggs, plus individual omelettes." “Cooks a dozen boiled eggs at a time or up to seven poached eggs." First, let’s get this out of the way. This cooker looks pretty darned cute. It’s shaped like an egg, or perhaps a very tiny space ship. Handles on the side make it easier to lift the lid, but oven mitts are a good idea, since it does get hot during cooking. This will steam-cook eggs to hard-, medium-, or soft-boiled, and can cook up to ten eggs at a time in two tiers. But this isn’t just for steaming eggs in their shell. It also includes removable trays so you can poach four eggs or make 3-egg omelets. The cooking time is controlled by the amount of water added, using the included measuring cup. There’s a simple on-off switch and a blue LED light, audible alert, and standby mode to help keep the eggs from overcooking. This also comes with a piercing pin to poke a small hole in the egg shell for easier peeling. 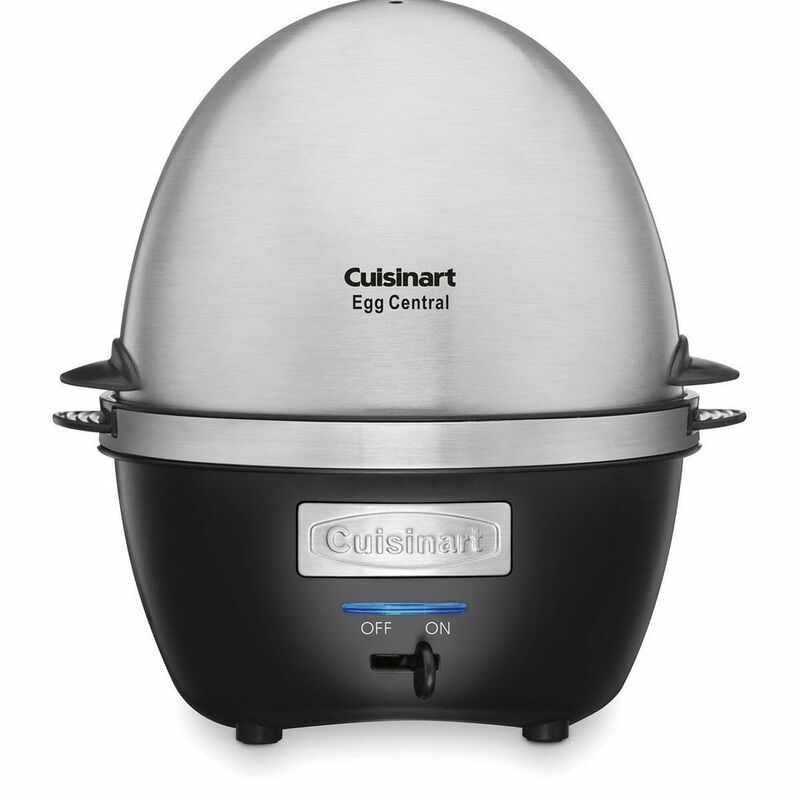 With a sleek design, stainless steel exterior, and a flat stainless steel heating plate, you’ll be making hard-boiled eggs in style with this countertop cooker. It has automatic power-off, over-temperature protection, and a light that shows that the unit is on. When the water has boiled out, the eggs are done, and the unit shuts off automatically. This holds seven eggs for boiling and you can choose to make soft-, medium- or hard-boiled eggs based on the amount of water used. They’ll be done in 8-10 minutes, which is much faster than cooking on the stove. This also includes accessories for making poached eggs or for steaming. If you’re looking for an egg cooker that won’t cost a lot but still gives you quality performance, consider this one from Dash. It lets you make up to six hard, medium, or soft-boiled eggs, plus individual omelettes, two poached eggs or scrambled eggs. The device comes with a poaching tray, measuring cup, omelette tray, and six egg holding tray. It’s simple to use, and all the non-electronic parts are okay to toss in the dishwasher. Most people were happy with their purchase of this product citing how great the eggs come out when using it and the fact that cleanup is super easy. One person complained about the jarring noise it makes when in use, so you might not want to use if someone is sleeping in the house or you have pets that don’t like loud noise. But most people were satisfied with the overall performance on this product. This adorable egg cooker is decorative enough to leave on your counter all the time, even if you don’t cook eggs every day. While the shape is fun, it’s a well-designed appliance that boils or poaches eggs easily. It can poach up to four eggs at a time, or cook up to seven eggs in their shells. Operation is easy—just add water to the marked level for soft-, medium-, or hard-boiled eggs, plug it in, and let the machine do all the work. A piercing pin prevents shells from cracking. When the eggs are done, the hen “chirps” to alert you, with a sound that different from all the other beeps in your kitchen. For easy cleaning, all of the hard plastic parts except the power base are dishwasher safe, but since you’re only using water, they’re just as easy to quickly wash by hand. If you need to cook a dozen eggs at a time, this is the cooker for you. You can make soft-, medium-, or hard-boiled eggs, or you can cook up to seven poached eggs in one go. The included omelet tray can be used for omelets or scrambled eggs. If you want even more versatility, you can use this to steam tortillas or vegetables. This has an auto shut-off, so you don’t need to be there when the eggs are done. This model comes in red or black; if you don’t need to cook as many eggs or want a more compact cooker, there’s a similar appliance that will cook seven eggs at a time. If you like the idea of an electric egg cooker that will make your egg-cooking foolproof, but don’t like the idea of a gadget that has only one use, you might like this food steamer. It has two stackable steaming trays that have divots for holding eggs upright. You can use one or two trays at a time or remove the center divider if you need to steam larger foods like a whole head of broccoli. The trays nest for more compact storage. Since this isn’t just for eggs, it has higher-end features, like a digital touchpad, an automatic keep-warm setting, a count-down timer, and a delayed-start feature. You can use it for fish, chicken, sausages, or vegetables. A rice bowl is included for steaming rice or keeping small food contained. Even with all of these features, it’s quite affordable. The steamer turns the heat off automatically if the water runs low, and it will beep, the display will flash, and the low water indicator will light up. You don’t need to remove the food to add water—just pull out the water drawer to refill, and restart the steamer to continue cooking. How easy is that? It seems impossible, but this microwave cooker lets you steam-cook hard-, medium-, or soft-boil eggs in ten minutes or less. You don’t have to pierce the shells first, and the eggs won’t explode. The secret is that the cooker shields the eggs from the microwaves, while at the same time the microwave heats the water to create steam to cook the eggs. The result is evenly cooked eggs without hotspots that sometimes occur with microwaved eggs—it’s just like steam-cooking on the stovetop or in an electric cooker. This cooker holds four eggs, and when you’re done cooking, you can just pop it in the dishwasher. But since it doesn’t get very dirty during cooking, it’s just as easy to give it a quick wash in the sink. Since microwaves vary in power, it might take a few tries to find the perfect cooking and resting time to get your eggs just the way you like them, but once you’ve figured it out, it will produce nearly foolproof eggs every time.